The holiday season is the perfect opportunity to show family and friends my perfect baby in an adorable babies first Christmas card, or so I thought. I had a vision of my son smiling and laughing with Santa while wearing a Janie and Jack Christmas outfit topped off with the teddy bear bowtie and leather crib shoe. After all, you only have one very first Christmas, so expense didn’t seem to matter when it came to creating the perfect Christmas card. As a first-time mom, I was shocked to find out that these days you have to make a reservation followed with a down payment to visit Santa. Living in Las Vegas this shouldn’t have been such a shock, but remembering my childhood years we would just stand in line to get to see the man in red. Vegas Santa actually has his own house decorated in vintage Norman Rockwell theme.My son looked great, the house was amazing and Santa was well… Santa. The stage was set for the “perfect” Christmas card. 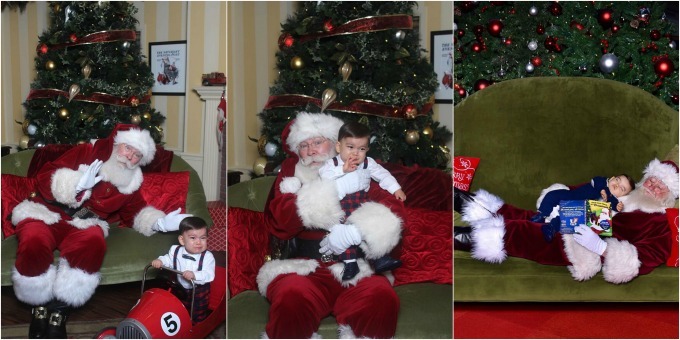 For anyone who knows my son, he is an exceptionally calm baby and goes to anyone — anyone, that is, except Santa! My son absolutely lost it! He kicked, screamed, and had tears running down his face and more snot then I was prepared to deal with. He was absolutely terrified. I thought, “This just can’t be” and begged to come back in an hour or two for a redo. We walked it off, played in the park, he was then fed and changed, and then off we went for Santa round two! Round two with the old Saint Nick was even more terrifying than the first round. It was obvious my son hated the man in red. I had to now be okay with my vision of my baby and Santa laughing and smiling, in what would have been the perfect Christmas card, now gone forever. Well it turns out that I wasn’t okay with it, and I actually went for Santa round three. This time I was in California at the exact Santa spot that I would go to as a child. You wouldn’t believe it, but Santa did not have his own house, and there was no reservation to be made. My son wasn’t in his perfect Christmas outfit but he happened to be sleeping, so I gently placed him laying on Santa and got what I consider to be the perfect Christmas card out of the shot. I guess I can say third Santa was a charm…that, and the fact my perfectly imperfect kid was sound asleep.